Happpppy hump day to all! I’ve got a few food pics to share with you on this Wednesday for my rendition of WIAW….What I’ve Been Eating Lately. First off, gluten-free spaghetti with meat sauce. I tossed in some kale, spinach, onions, and ground beef into the spaghetti sauce. And of course, I had to top the whole thing off with parmesan. I love this meal. Lunch in New York: A burger. Go figure. My body really craves the iron from the red meat. Although my gut hasn’t been appreciating the greasy food. A side of super amazing brussels sprouts to try to “balance” my meal. These were so incredible. I’m guessing they were roasted in olive oil and seasoned simply with salt and pepper but if that’s all it is, then why can’t I make them this good at home? I was so absorbed in the events of the wedding that I neglected to take a single food photo. There was A LOT of food and a lot of GOOD food! Take my word. Saturday morning I was wiped. This girl just can’t stay up until midnight like she used to in the old days. Room service was a must. Oatmeal for me, with a side of fruit. Back at the ranch home, I tried getting back on the healthy food train after my 29 hours away with a big ol’ green salad. Unfortunately I had to do everything in my power to get this down. Like I mentioned, these days sometimes nothing sounds or tastes good! On Monday I made Peas and Crayon’s Broccoli Cheese Soup. Coincidentally, she is the one who hosts the WIAW link up! This soup was pretty darn tasty if you ask me. I learned my lesson though to make sure and measure seasonings such as cayenne in a soup, because apparently my “eye-balling” it method made for a soup with a bit of a kick! I had to add extra broth and half and half to try to tame it down. Last night I made a cranberry BBQ chicken (recipe to come soon). I melted monterey jack over the chicken and served it alongside a baked potato and green beans. After eating almost this entire plate of food, I remembered why I really shouldn’t eat big meals anymore. I just felt nasty. Smaller meals is the way I need to go these days. It’s just tough to do with work! I’ve been a cereal eating machine lately. 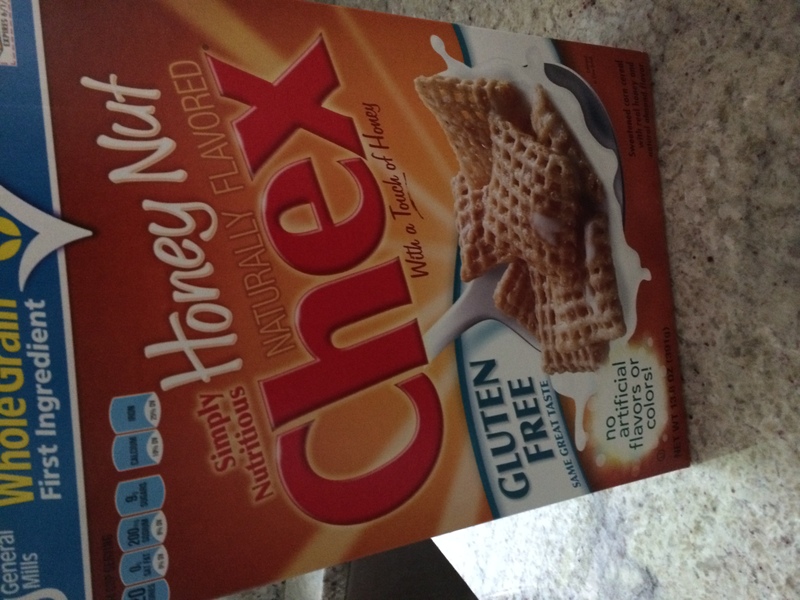 My latest grocery grab was Honey Nut Chex. And lots of blueberries have been consumed in the last week as well. Lots of good eats once again! Thanks to Jenn for hosting WIAW! Do you prefer small meals or large meals? What’s your favorite cereal lately? I am most definitely linking up with Becky for Treat Yourself Tuesday today because I have been treating myself quite a bit lately. This weekend I treated myself to time in the kitchen. I baked up a couple of loaves of gluten-free bread using brown rice flour and almond flour. And I made these amazing snack bars! I enjoyed a relaxing evening with two calming essential oils: gentle baby and lavender. I also treated myself to a couple new ones: ylang ylang which smells AMAZING and citronella to try diffusing when we are sitting out on the deck to help keep the skeeters away. On Saturday Dana and I treated ourselves to lunch at The Bulldog in Minneapolis. We were both in the mood for a good burger (typical these days) and Becky recommended this place for amazing burgers, so we thought we would go check it out. Patty melt for me! So good! I treated the babes to a new outfit from Target. It was on the clearance rack for $5 and I just couldn’t resist. I also treated myself to some maternity clothes and some looser fitting regular clothes. Besides pants and shorts, I should be set for a while! I stocked up on dresses! Last night I was treated by my brother as he cooked up an awesome stir-fry dinner for me and the fam! As much as I love to cook, I love it even more when someone else cooks for me! Thank you Becky for hosting the link-up! How did YOU treat yourself this week?! We are so excited to know that we are having a boy and are dreaming about what he will look like, what his personality will be like, and what his interests will be! I’m also having a really good time starting to think about how I want to decorate the baby room. Yesterday I was a busy girl in the kitchen. Along with baking GF bread, and prepping fruits and veggies, I also put together a super tasty, fudgy, chocolaty bar. This bar is refined sugar-free, raw, and perfectly healthy! It’s great as a snack or even a dessert. They are so easy and so delicious. I ate three yesterday and wanted to keep going back. What I love about making my own bars is that I can make them in whatever sizes I wish. I like to make them in a variety of sizes because you never know when you might need just a mini pick-me-up or a more substantial one! In food processor, add almonds and walnuts and process until they resemble wet sand texture; pour into small bowl and set aside. Add dates to food processor. Process until mixture begins to form a ball, and pieces are small. Add nut mixture and cacao powder into food processor with the dates. Process until combined; about 1 minute. Form combined mixture into bars or balls using your hands and store in air-tight container in the fridge for up to two weeks (they last longer but they start to get hard). There you have it! You don’t have to get the oven going, they are easy, AND they are healthy. There’s no reason not to make these cute lil’ guys!